The Republic of Nauru is a small isolated Central Pacific island lying some 26 miles south of the Equator, (...) some 2,500 miles from Sydney, 2,600 from Honolulu and 3,000 from Tokyo. The island is a raised atoll, with a surrounding reef which is exposed at low tide, has a circumference of 12 miles and an area of just over 8 square miles. From a narrow coastal belt where most of the population reside, coral cliffs cover some 3/5ths of the land area. A plateau rises to some 213 feet above sea level at its highest point. The plateau covers approximately four fifths of the land area, and contains valuable deposits of rock phosphate. The first Europeans to visit Nauru named it Pleasant Island, so enchanted were they by its lush tropical vegetation and friendly inhabitants. (...) The weather is generally hot and humid tempered by occasional sea breezes, with a variable annual rainfall which averages 200 cm (80"). Its vegetation on unmined lands includes coconut palms, the forest tomano, figs, almonds, mangoes, wild cherry, pandanus and many smaller species. The indigenous people of Nauru customarily comprised twelve tribes, symbolised by the twelve-pointed star on their national flag. They are mostly of Polynesian and Micronesian descent. They speak Nauruan, a distinct Pacific language, with English being used for government and commercial purposes. 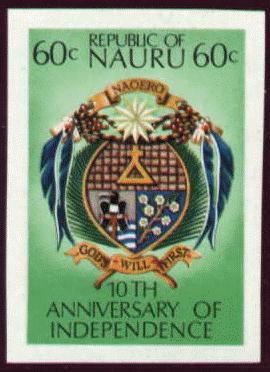 The total population of Nauru numbers about 10,000 people, of which around 6,800 are indigenous Nauruans. The remainder are temporary residents made up of expatriate contract workers. Nauru is governed by an elected legislature with a Westminster style Cabinet presided over by a President who is also Head of State. It is a special member of the British Commonwealth of Nations. The current President and Finance Minister is The Hon. Kinza Clodumar MP (...). [Discovered] by Captain John Fearn in 1798, as he was sailing from New Zealand to China Seas (...) Nauru existed as an independent island society until it was annexed by Germany in 1888 as part of the Marshall Islands Protectorate. In 1900 a British company discovered phosphate on the island and negotiated with Germany for mining rights. In November 1914 Nauru was seized by Australian troops and remained in British control until 1921. At the end of the war, when the German colonies were detached, a League of Nations C Class Mandate was granted to Australia, New Zealand and Great Britain. The three countries provided for an Administration and set up the British Phosphate Commissioners (BPC) to run the phosphate industry. In 1947 the island was placed under United Nations Trusteeship and Australia resumed administration on behalf of the three partner governments (...). Nauru became an independent republic on 31 January 1968. The presentation of Nauru in the "New Flags Flying" series by "Radio New Zealand International" includes a black and white photo of the official unveiling of the flag, captioned as follows: "Displaying the new flag, 31 January 1968. Left to right: Mr DJ Carter, representing the NZ Government; Mr CE Barnes, Australian Minister for territories; Sir Charles Johnston, representing the United Kingdom; and Mr Hammer deRoburt, Head of State of the Republic of Nauru." I just checked in Smith 1975: "The geographical position (...) of Nauru finds graphic expression in the symbolism of its flag (...). The island is just one degree south of the equator (...) to the east of the international date line, hence the yellow horizontal stripe on blue and the off-center star immediately below the stripe." The Security Council on 25 June 1999 recommended that (...) Nauru become the 187th member of the United Nations. Last step to membership will be General Assembly resolution later this year. According to Dorling Kindersley 1997, the 12 points of the star stands for the 12 local tribes. According to Les Chiffres du Monde (Encyclopaedia Universalis Yearbook 1998), Nauru has no armed forces. Defence of the country is managed by Australia, although there is no formal agreement about it. Nauru has a police force (57 men). It is divided in 14 districts (areas ranging between 0.5 and 3.1 km2, population ranging between 87 and 2,600 inhabitants). I have read that Nauru might be the next country to disappear, due to exhaustion of its phosphate stock. 80% of the land of Nauru is made of phosphates and 60% of the stock has already been dug out in the early 1980s. The Nauruan government plan is to abandon the island before total depletion of the stock and buy another atoll to establish the population. This is not unrealistic since Nauru might be the richest state in the world. As far as I know this project of moving after the end of the phosphate stock is a myth. It has been said in the 1980s that Nauru wanted to buy an island near the coast of Queensland, Australia. But, in my opinion, it was just a rumour linked with the standing court case at the moment against Australia before the International Court of Justice at The Hague (in order to determine the responsibilities of Australia as administering authority in the damages caused to the resources of Nauru). By the way, this idea of buying a new island is more and more unrealistic, because of the mismanagement of the money the island invested during its lucky years  that's the reason why the political situation of the island is not very stable (many presidents) since the death of Hammer DeRoburt, its first president (1968-76, 1978-1986, and 1986-89). In conclusion, Nauruans will stay on their island; evidence, they have just finished building a new harbour in Anibare (Pacific Islands Report). The flag of Nauru being linked with its geographical situation, there should not be any flag change in the forthcoming years. The National Flag is royal blue divided by a horizontal central band of gold with a white 12 pointed star in the lower left quadrant. The blue symbolises the Pacific Ocean, the gold band the Equator and the 12 pointed star 12 tribes of the Nauruan people. The protocol manual for the London 2012 Olympics (Flags and Anthems Manual London 2012) provides recommendations for national flag designs. Each NOC was sent an image of the flag, including the PMS shades, for their approval by LOCOG. Once this was obtained, LOCOG produced a 60 x 90 cm version of the flag for further approval. So, while these specs may not be the official, government, version of each flag, they are certainly what the NOC believed the flag to be. For Nauru: PMS 280 blue, 123 yellow. The vertical flag is simply the horizontal version turned 90 degrees clockwise. The colours are specified in the (now redundant) British Admiralty Flag Code as "Royal Blue T1140, Standard Gold and Standard White", while the "standard flag" is given as "6 ft x 3 ft" (91 cm x 182 cm). According to Album des Pavillons 2000, the width of the yellow stripe is 1/12 of the hoist (i.e. 2 units on image, the unit being 1/24 of hoist size). The star is set in the vertical line 1/4 of the fly from the hoist, touching the the yellow stripe with upper ray. The diameter of the inscribed circle is double the width of the yellow stripe (i.e. 4 units), and the outer diameter is double the inner (so 8 units). Construction details for Nauru national flag in Album des Pavillons 2000 come from Whitney Smith's Flag Specification Sheet. Pantone colour shades were given to me as official on 15th May 1997 by Jennifer Austin, Assistant to the Public Affairs Consultant, Republic of Nauru. CMYK data were my approximate translation. The 'Republic of Nauru Flag Specifications', issued on May 31 1968, states "The proportion of the flag is 2:1. The length of the fly equals 2, and the width of the hoist equals 1". The band is "located horizontally across the centre of the flag. Width - 1/12 the hoist". The star is "located in bottom left-hand quarter. The centre of the star 1/4 the fly, or length, from edge of hoist. Size of star: outside diameter 1/3 of the hoist". The coat of arms is of local design and includes the chemical [incorrect  see below] symbol for phosphorus; phosphates are Nauru's main export. Beneath it are a frigate bird and a sprig of tomano. The shield is surrounded by coconut leaves. Above is the 12-pointed star beneath a yellow scroll bearing NAOERO in black. What is depicted is the alchemists' symbol for phosphorus (a triangle topped with a cross). The modern symbol for phosphorus is simply the letter P.
Editor's note: see an image of the Nauru coat-of-arms on a stamp. It is the flag of the Shipping Company. It is a house flag. The civil ensign is flown at the stern, but a house flag or company's flag is flown on a mast or pole in the center of the ship.